The Labor Day weekend has come and gone. Students of all ages are back in school or off to college. So as summer winds down, it’s time to buckle down and get serious with plans for your fall home improvement projects. As we’ve previously posted, outdoor structures are one of the few home improvements that are currently considered a solid, safe and secure investment. Structures such as decks, are a way to economically increase your home’s square footage. And decks, as well as other outdoor spaces, are useful now and considered valuable features when it comes time to sell your house too. But what if your yard is narrow, sloping and close to the neighbors? Can a deck be added to any home regardless of layout and lot size? So let’s go ‘back to school’ with an Archadeck case study to illustrate ‘Deck Design and Deck Building: 101’. Our customer lives in Kirkwood, Mo — a quaint and historic community known for magnificent old trees and beautiful older homes. Houses in this particular neighborhood are close together with walk out lower levels on sloping lots. The kitchens were designed to overlook a side yard, rather than the backyard. And since the home was built 50+ years ago, there was no forethought of building a deck. First, Archadeck changed a kitchen window to a door. The door from the kitchen became the natural point of transition, from inside to out. Second, Archadeck designed a tall, privacy gate as an entry/exit to the side yard. The lot was nearly ground-level here and only three steps were needed to go from deck to the side yard. Third, a safety gate was used at the opposite end of the deck with stairs leading to the backyard patio. Plenty of deck and yard access was achieved while accommodating the contour of a sloping lot. 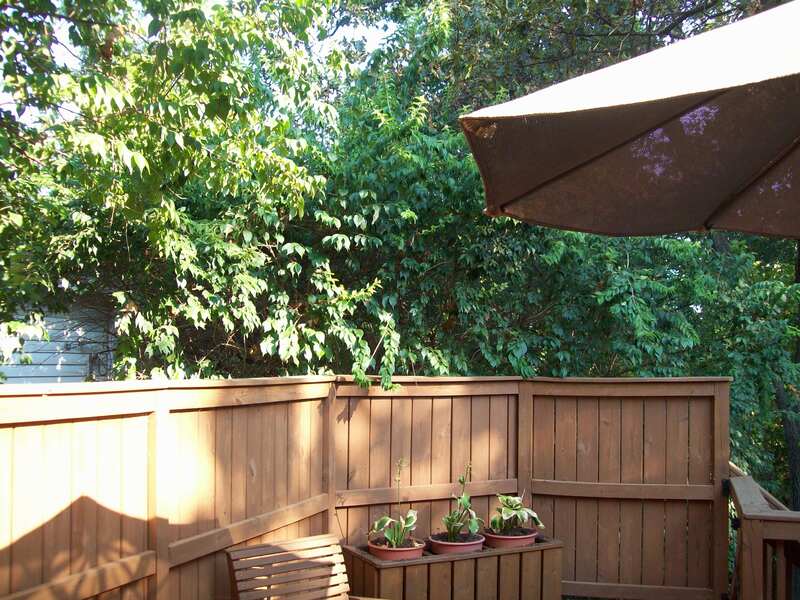 Fourth, the deck was built out to the very edge of side yard trees in order to maintain the natural shade. Fifth, a tall privacy rail was used to surround the majority of the deck in order to ensure plenty of separation. Sixth, Archadeck added a deck security light just outside the kitchen door, motion detector lights under the deck for lower level security and electrical outlets on the deck for convenience. Finally, an open railing system with balusters was used to accentuate the view of wooded backyard. The end result: A beautiful 300 square foot deck extension just outside the kitchen door with access from the backyard and side yard, with total privacy where needed AND an open view of the wooded yard… all at an economical price. Now that’s what we call custom deck design by Archadeck! Give us a call, 636-227-0800 or visit our website, west-county.archadeck.com, for more information and ideas. We serve the Greater St. Louis territory including St. Charles County and parts of Illinois. If you’re outside of St. Louis, visit archadeck.com for additional locations.